How long does will it take for Treasury Secretary Tim Geithner to realize that his comments move markets? When he first took office, he mistakenly threatened to brand China as a currency manipulator. This caused a wave of volatility in the currency market and sharp criticism about the experience of the new Administration. 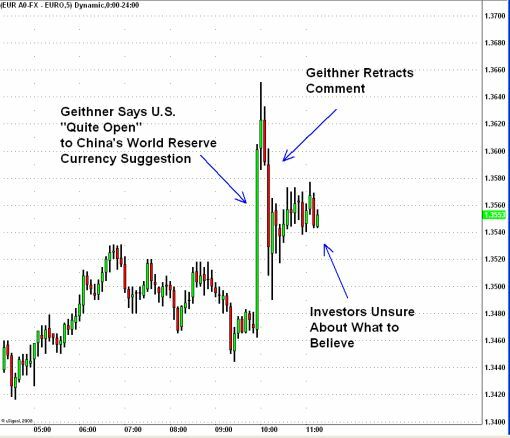 And now, Geithner has done it once again (Geithner Comments send Dollar for a Ride). These contradictory statements are clearly the act of an amateur Treasury Secretary that is forced to eat his words. Why has the dollar had such a big reaction to these comments? Because if the world adopts the SDR, which was created by the IMF as an international reserve asset, it would mean less demand for U.S. dollars.